Beautifully engraved certificate from the Royal Arcanum issued in 1892. This historic document was printed by the American Banknote Company and has an ornate border around it. This item is hand signed by the Company’s Secretary and is over 110 years old. It has been fold and shows some wear. 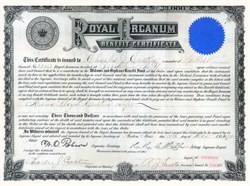 The Royal Arcanum is one of the oldest fraternal benefit societies in the United States and the Dominion of Canada, operating under the fraternal system, which offers many social and fraternal benefits to its members. The Royal Arcanum is the only surviving founding member of the National Fraternal Congress of America, an organization representing over 90 fraternal benefit societies and 10 million fraternalists. Founded with unselfish motives on the part of its creators, conducted upon sound business principles, improved by an experience of over One Hundred and Twenty years, it has all the facilities for successfully promoting its objectives. Uniting fraternally all eligible male and female persons of sound bodily health and good moral standing, who are socially acceptable. Giving moral and material aid in its power to its members and those dependent on them. Teaching morality without religious distinction, patriotism without partisanship, and brotherhood without creed or class. Educating the members socially, morally and intellectually. Assisting the families of deceased members. Establishing funds for the payment of Death Benefits, Educational Loans and Annuities. The Royal Arcanum is founded on the principles of good citizenship. It promotes love of country, home and friends; the Fatherhood of God and Brotherhood of Man; faithfulness in performance of obligations of the home; honor in your dealings with mankind; generosity with those less fortunate than yourself; sympathy, kindness and consideration for the bereaved and distressed.